GeoGlass is based in Blakedown, near Kidderminster. My kiln is 8” square internally which means, allowing for circulation within the kiln, that finished items are limited to 7” maximum dimension. If items are slumped into or over a mould the size will sometimes be reduced a little. In practice almost all items are slumped as I like my glassware to have a three dimensional feel. 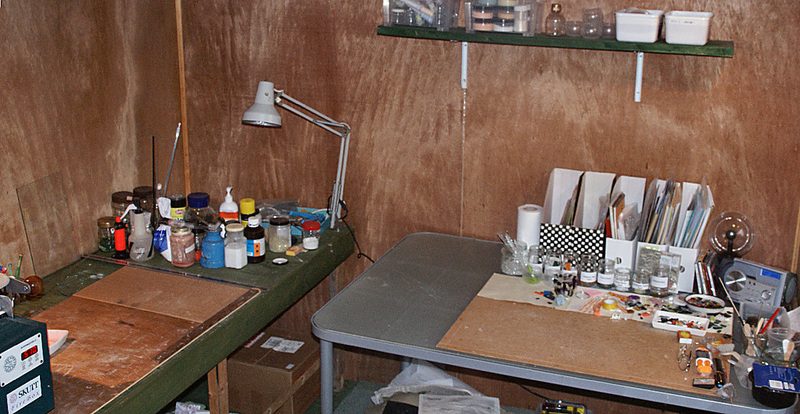 My ‘studio’ is a garden summerhouse that I’ve converted for the purpose, this houses my kiln and workspace. Drop me an email if you’d like to visit. Getting involved in glass-work was sparked by a visit to the wonderful Ebeltoft Glass Museum in Denmark. After several months of making not very interesting coasters and wall hangings I've moved onto a more abstract and three dimensional technique. There are usually two stages, the first being to form the flat fused glass, the second to slump it using various ceramic/metal moulds. Forming the flat fused piece usually involves arranging many small pieces of coloured glass to achieve the effect I'm after. The mould itself often has to be created either by cutting out sections from old ceramic items, often sourced from charity shops etc. (a diamond-tipped tile-cutting rotary saw bench does the job very well) or by making a clay mould using air drying clay.